The 4Humanities "WhatEvery1Says" project conducted a comparative analysis in 2016 of the following topic modeling systems/interfaces. As a result, it chose to implement Andrew Goldstone's DFR-browser for its own work. Report first published on November 26, 2017. Description: E. Hoque and Giuseppe Carenini (2015), "ConVisIT: Interactive Topic Modeling for Exploring Asynchronous Online Conversations"
An all-in-one, start-to-finish system that does its own topic modeling of a corpus. 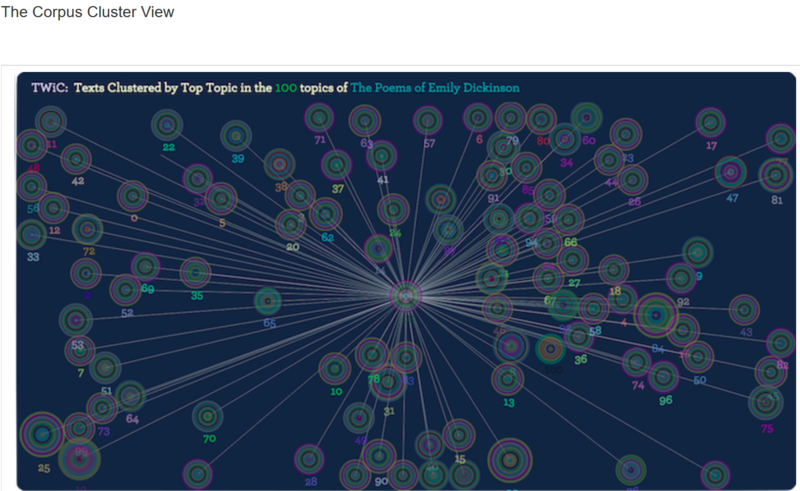 Interactive visualization interface designed for topic modeling asynchronous conversation on the Internet (email, blog comments, etc.). Feedback on the interface was assessed through a user study. Alan: Can it be adapted for articles? 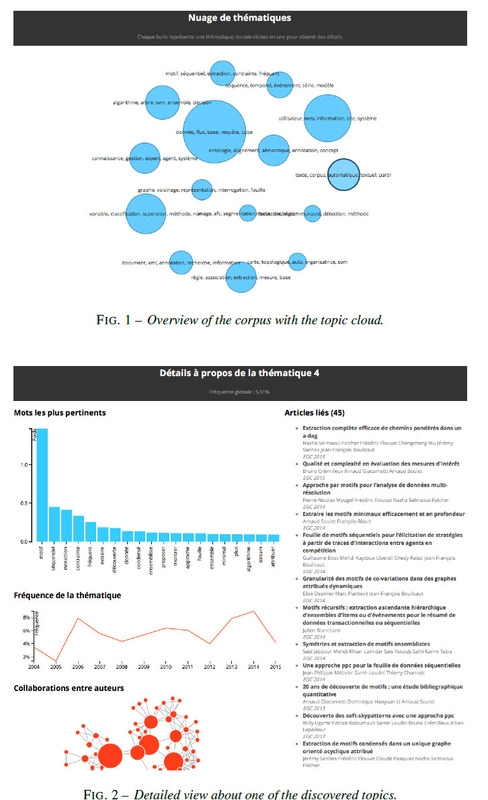 "Topic" view (bottom figure at right) showing a ranked list of words in the topic with bars representing relative weight (left panel), a timeline graph of the topic's weight in the corpus, and a list of articles ranked by the amount of the topic infused in them. Clicking on a word in the ranked list of topic words brings the user to → "Word" view, which shows what other topics the word appears in (and its relative weight in that topic). Clicking on a bar in the timeline graph of a topic brings the user to → a view showing the top documents in that year infused by that topic. "Preparing data files entirely on the command line"
"Adapting this project to other kinds of documents"
Lindsay: I kind of got this to work. With Goldstone's new instructions and the prepare-data python script, I was able to figure out how to get the data into the format the browser needs in the command line. I was also able to do this using the dfrtopics package in R with a pre-run mallet file (which I did in the command line). However, I haven't yet figured out how to properly configure the browser's main js file so that it will all display properly (right now only the overview view works as it should). Also, I tried this on a very small subset of our corpus (10 articles from the NYT) because getting the metadata into the right shape so that dfrtopics/the prepare-data python script can read it properly is still something I don't know how to do. I just did it manually, and it worked, but we would have to create a script that could wrangle metadata for us in order to do this for a larger number of documents. 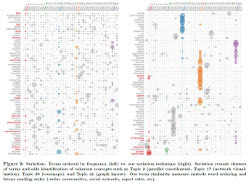 See also Jaimie Murdock and Colin Allen (2015), "Visualization Techniques for Topic Model Checking"
An all-in-one, start-to-finish system; does its own topic modeling of a corpus. 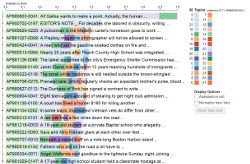 The relative size of each color band among all the colors in a document indicates the weight of specific topics in the article. The cumulative width of the color bands for a document indicates the similarity of the document to the user's current "focus" topic (or document). Clicking on a color anywhere reset's the "focus" to the topic corresponding to that color, with the whole list of articles and color bands shifting to reorient around that topic (ranked with the articles most expressive of that topic at the top). When a topic is selected, clicking the "Top Documents for [Topic]" button at lower right of the interface "will take you to a new page showing the most similar documents to that topic's word distribution." There is a search function to identify which documents in a corpus contain a word. Alan: This is a package for Python 2.7. I tried to install, but installation of the underlying VSM module failed. One issue that appeared in the error messages: "error: Microsoft Visual C++ 9.0 is required (Unable to find vcvarsall.bat). Get it from http://aka.ms/vcpython27" I've seen this error before when a package installation on a Windows machines calls on Visual C++ as its compiler, but the particular machine does not have Visual C++. Scott: The above issue has supposedly been addressed (as of May 25, 2016), so it might be worth pulling the repo again. The tool has some interesting features that might help in defining stopword lists. Topic modeling workflow: Takes input from Mallet. A line graphs the topic "density" of passages in the document, with peaks indicated with asterisk. Clicking on the asterisk calls up a list of links to other passages (including in other documents) that are dense with that topic. Note: one interesting theoretical tenet of The Networked Corpus is that topic modeling produces an apparatus for understanding texts and moving around them non-linearly in a way analogous to earlier "indexing" (and other such apparatus) in the history of writing and print. Scott: Instructions for implementing The Networked Corpus. ; includes adapted version of the code files as zip file; currently the instructions are for implementation on a Windows machine. Alan's step-by-step version of Scott's instructions, including a temporary kludge solution for non-ASCII character problems (arrived at after debugging correspondence with Scott below). Scott on the DLL load error: "I think the answer might be here. Try running conda update scipy from the command line." I'm guessing this is the kind of error that caused you to start debugging the unicode problems in the first place. Let me know if you have any suggestions." Scott's response: "The line causing the Unicode error is part of a loop through a directory file list, so it seems to run into problems if the directory contains something other than the text files you are using to generate your topic model, This includes the Mallet output. When I set line 303 to a directory containing only the text files (in this case, one of your early New York Times collections), I didn't get the error. Unfortunately, I got another error at the next stage, where the script was getting hung up at the name "François". Obviously, we can avoid this problem by striping diacritics,but we shouldn't have to. When I get a chance, I'll try to figure it out. But go ahead and try the advice in the previous paragraph, and see if it works for you." Alan's error report: "Thanks, Scott. I see. I was misunderstanding what the "datadir=" in line 303 is supposed to point to: the directory of original text files and not the directory of Mallet output files for the topic model of those text files. Alan: Just to add information that may, or may not. be relevant to Scott's original problem with Unicode issues as documented in his note: the WE1S scraping workflow saves all plain-text files in UTF-8. A Python port of the LDAvis R package. For a concise explanation of the visualization see this vignette from the LDAvis R package. Takes input from multiple types of topic models. The GitHub site links to numerous examples and demos. Requires scikit-bio package, which is not yet supported for Windows. Windows support is scheduled for July 2016. In the meantime, there may be a workaround here, but it has not yet been tested. Additionally, scikit-bio is now no longer compatible with Python 2 and thus would require a separate Python 3 virtual environment (although that's relatively easy to do in an Anaconda installation). It may be worth looking into using the R package. Note: Parts of the descriptions and screenshots in the mini-report on Serendip here are excerpted from Scott Kleinman's report-on-serendip.pdf. Other descriptions and one screenshot are based on the Eric Alexander et al. article. See also the Project iPython notebook site. Serendip runs in a Python-Flask environment. It comes with a separate command-line tool to call Mallet and generate topic models. The Mallet output data is deposited in a Corpora folder and can then be accessed by the Serendip interface. In addition to implementing Mallet, the command-line tool generates multiple files used by the interface to navigate and manipulate the data. Therefore, Serendip will not work if independently generated Mallet output files are deposited in the Corpora folder. It is possible that the script could be modified to read independently generated Mallet data, but this would require some hacking of the Python script. CorpusViewer: "At the corpus level, we provide a reorderable matrix to highlight adjacencies between documents and topics." This view shows "a re-orderable matrix that connects documents to topics. To address the “many documents” and “many topics” issues of scale, the matrix supports filtering and selection, aggregation, and ordering." "We provide a query-system that allows users to pick out documents and topics based on their metadata. Once selected, these sets can be hand-tuned, colored, moved to a more prominent position in the matrix (typically the top-left corner), used as a basis for reordering the matrix ... or saved to be explored later." 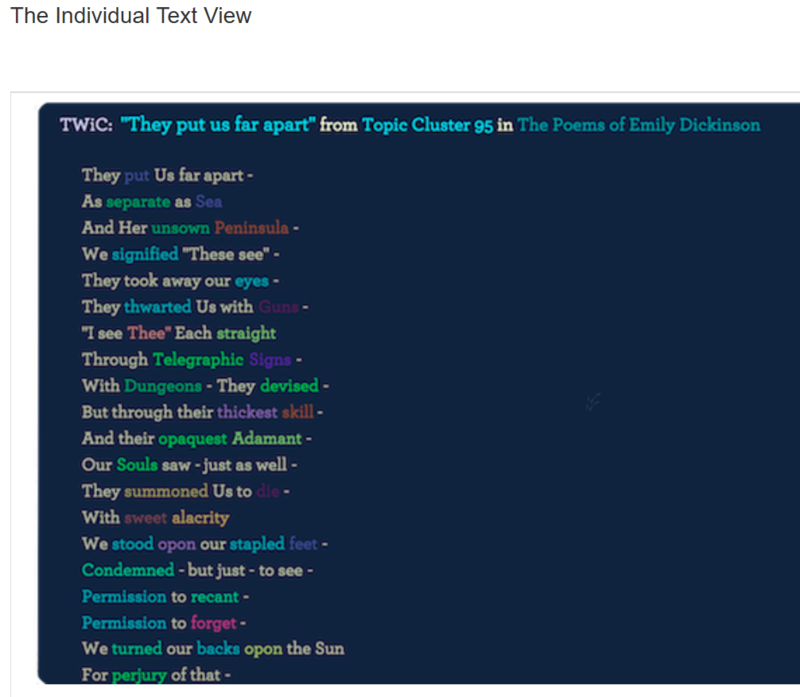 TextViewer: "At the document level, we use tagged text and overview displays to help readers find and analyze passages in large documents." 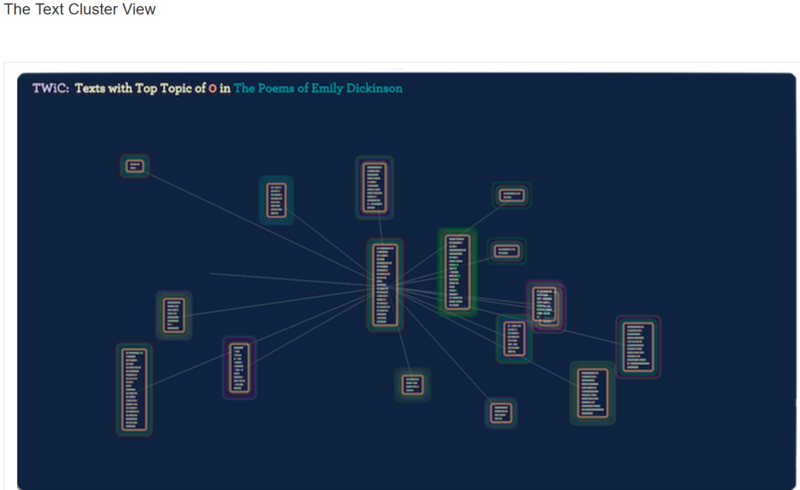 This view shows a "tagged text visualization shows the topics and the text. To support long documents, a summary graph shows how the topics occur over the length of the document." 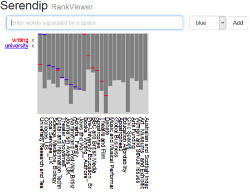 RankViewer: "Finally, at the level of individual words—a level we only observed the need for after watching users interact with our text level tool—we introduce a ranking visualization that shows how words are distributed across the topic." 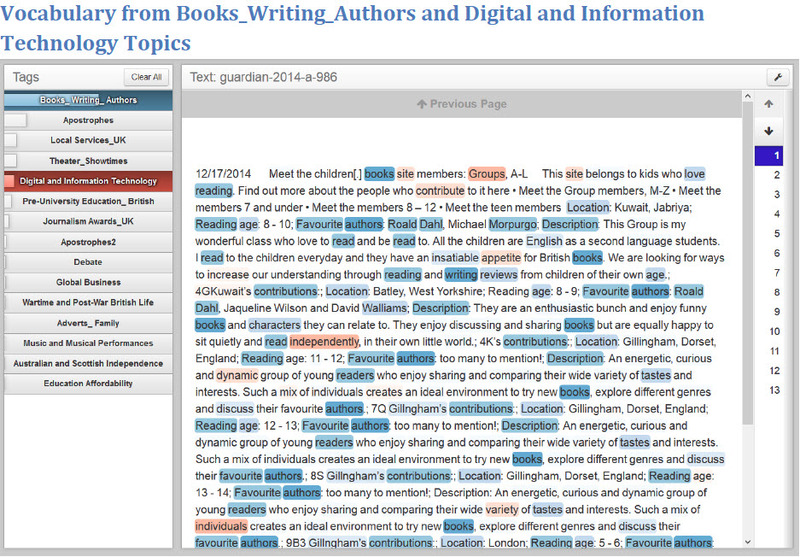 This view "allows users to examine specific words and see which topics use them. This tool is useful for relating topics and words, and comparing different topics and words. It can provide topics (and orderings of topics) to explore more closely in other views." Saliency (frequency multiplied by information gain) -- finds salient words across an entire model, not just within a topic. Saliency is the default ranking metric. See also: Jason Chuang, Christopher D. Manning, and Jeffrey Heer (2012), "Termite: Visualization Techniques for Assessing Textual Topic Models"
Termite appears to by a Python system that imports Mallet data files to work on. 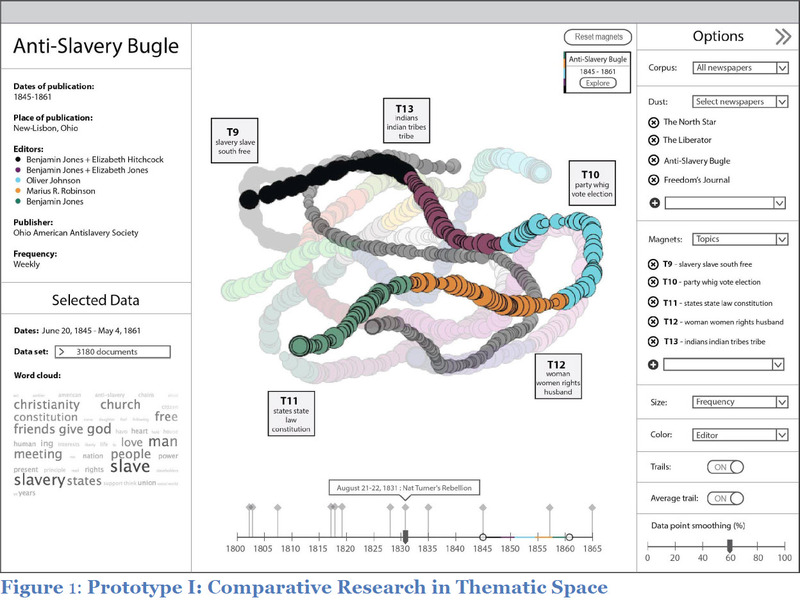 Notable interpretive features of interface: Dynamic visual analysis tool designed specifically to augment the user's ability to assess the quality of topic models and topics. Word frequency (1st figure on the right) -- the bigger the circle, the more frequent the word in the topic is. Word "saliency" (compared to frequency in the 2nd figure to the right) -- the bigger the circle, the more salient the word in the topic is. ("Saliency" is calculated in a way that answers the question, to put roughly, "not only how probable it is that the word occurs in the topic but also how 'distinctive' is the word in its relation to the topic. [precise mathematical definition on p. 2 of the Chaung, Manning, & Heer article]). The interface allows users to drill down to other views: "Users can drill down to examine a specifc topic by clicking on a circle or topic label in the matrix. The visualization then reveals two additional views. 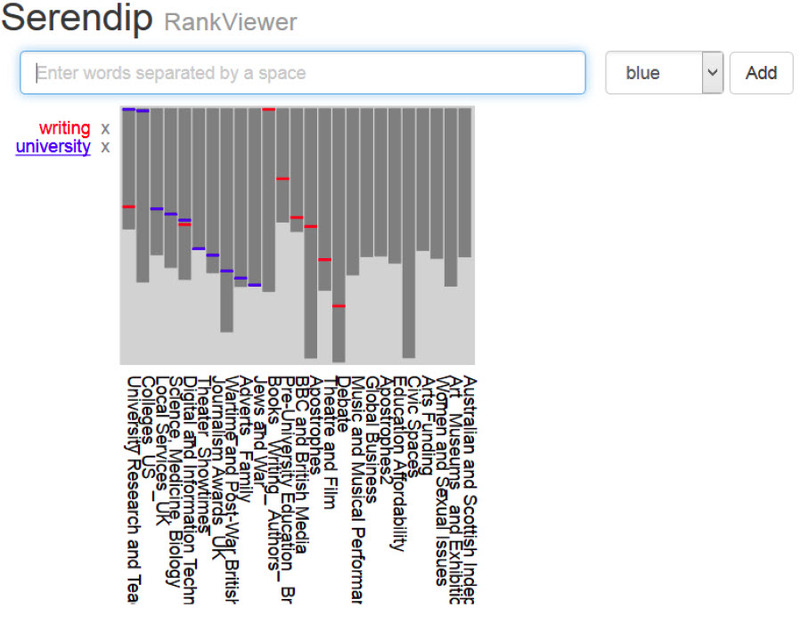 The word frequency view shows the topic's word usage relative to the full corpus. The document view shows the representative documents belonging to the topic." The interface allows for various ways to order topics and terms in the visualizations. One of the most important is the ordering of terms in topics through a "seriation algorithm". It incorporates in the metrics collocation frequencies of words with other words (compared to frequency in 3rd figure to the right). 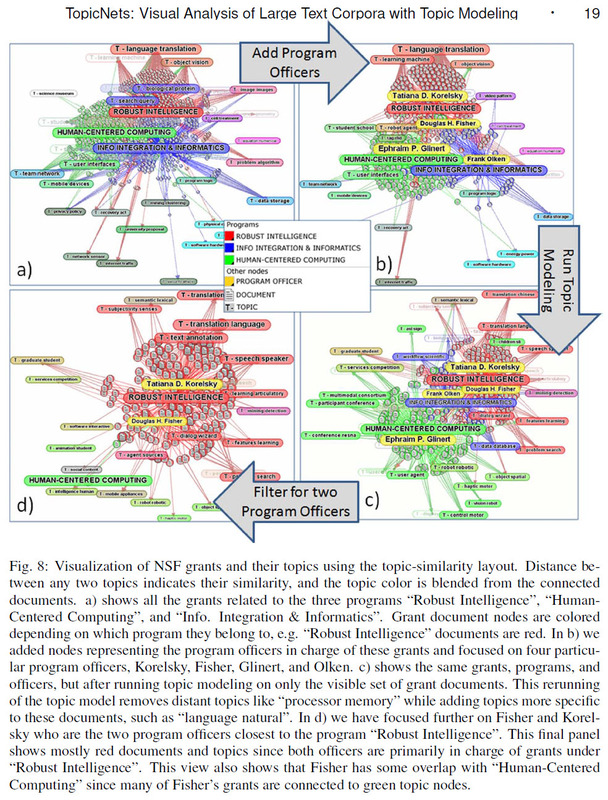 For example, the right matrix in the 3rd figure at right shows a seriated view of a topic model in which Topic 25 displays a clear clustering of collocated terms (the orange circles). Such seriated clusters assist in identifying key concepts in topics (not just topic words, which may be hard to understand in their distribution). 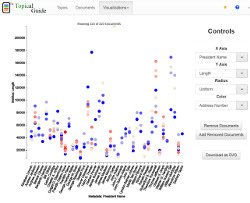 Visual analysis tool for assessing topic model quality. Termite uses a tabular layout to promote comparison of terms both within and across latent topics. It uses a novel saliency measure for selecting relevant terms and a seriation algorithm that both reveals clustering structure and promotes the legibility of related terms. Termite Data Server "for processing the output of topic models and providing the content as a web service"
Termite Visualization "for visualizing topic model outputs in a web browse"
Scott: I got this mostly working a few years ago, but for some reason I don't recall it matching my research needs at the time. Alan: "After spending a week working at implementing Termite, I've concluded that it's basically not possible on a Windows system. Termite seems to be basically scripted for Linux or Mac all the way through. On a windows system, I can't compile, can't run scripts, etc. In regard to Termite: recall that in the past (before 2014), Termite was a simpler system (and also constrained to topic modeling only a single file, rather than folder of files, at a time). Now they have forked their code into a data server (topic modeling creation and local server system), on the one hand, and a visualization system, on the other hand. It's the data server that has me stuck." Scott: Update of March 21, 2016: "I had a look at the Termite code again last night--the old code, rather than the new split system. The one file constraint is actually a file with each document on a separate line. You could write a file from a folder like that (but probably not one with 30,000 documents). That's probably how I did it in the past. It seems possible to inject data at certain points in the pipeline, so you could run Mallet separately and start Termite at the salience calculation stage. But it would take a bit of hacking--sadly something I don't have time to do now. But it's something to keep in mind if we find that the client-side lag time in Serendip is untenable in the future. It may be that neither tool is built for large data sets." An all-in-one, start-to-finish system; does its own topic modeling. At present, this seems to be a system designed for use in corporate settings to work with corpora of well-structured documents (such as emails and medical information, which are the examples in the article). Notable interpretive features of interface: A dynamic visualization system that is specialized to Lotus Notes and only usable (apparently) by IBM corporate users. Tiara does its own topic modeling, and in addition derives time-related data (e.g., dates of emails in an email corpus) from the documents. 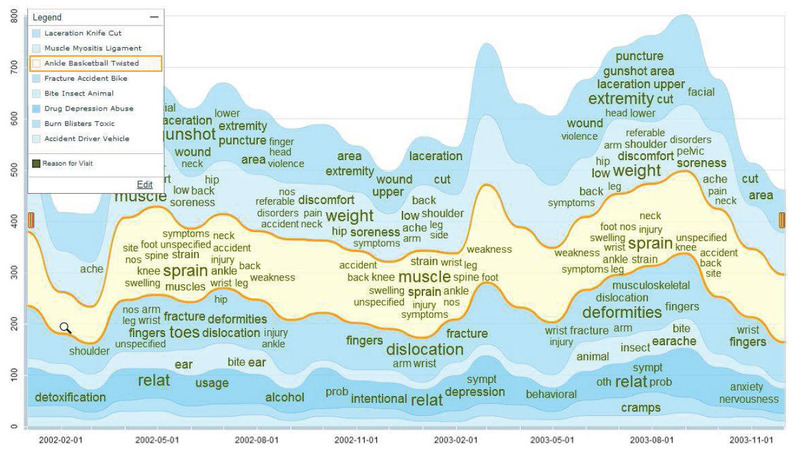 It uses the time-related data to create a timeline of topics in a stratified, layered view in which each topic-layer is populated by key topic words and varies in thickness based on weight in the corpus at the time. Clicking on a topic-layer zoom in on it (widens the layer and shows more topic word detail). Topics can be reordered; the system also supports user merging and splitting of topics. Description: Adrien Guille and Edmundo-Pavel Soriano-Morales (2016), "TOM: A Library for Topic Modeling and Browsing"
A start-to-finish system. It takes input from a corpus (optionally supplemented by metadata on dates, authors, etc. ), then pre-processes it by lemmatizing the text (English or French). It creates two kinds of topic models: LDA and Non-negative Matrix Factorization (NMF). It also uses algorithms based on state-of-the-art computer science research on topic models to help the user optimize the number of topics (see "Parameter Estimation" paragraph on p. 2 of Guille and Soriano-Morales article). 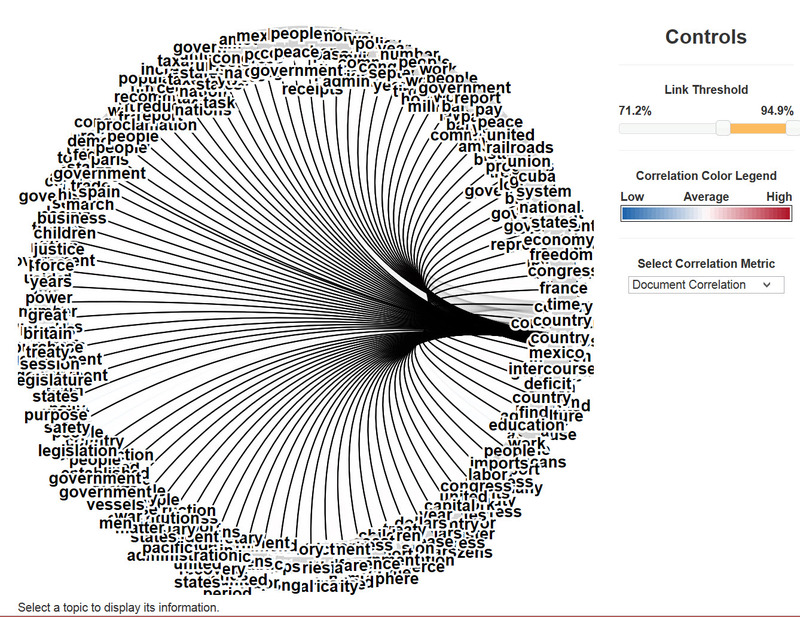 A "topic cloud" view (figure 1 to the right) shows each topic in a bubble that is labeled by the most relevant words and whose diameter indicates its weight in the overall corpus. 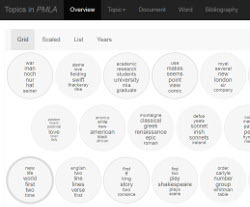 A topic view, a text view, (and also author view, if there is metadata on authors), as in the lower figures to the right. "For instance, the detailed view about a topic presents the most relevant features, the evolution of the topic frequency through time, the list of related texts and the collaboration network that links authors. The detailed view for a text presents the most significant features, the topic distribution and the most similar texts. Also, note that some elements may be missing, depending on the meta-data available with the input corpus." NEH Digital Humanities Start-up Grant Proposal (2013): Lauren Klein, Principal Investigator, "TOME: Interactive TOpic Model and MEtadata Visualization"
See also the related publication: Eisenstein, J., I. Sun and L. Klein. 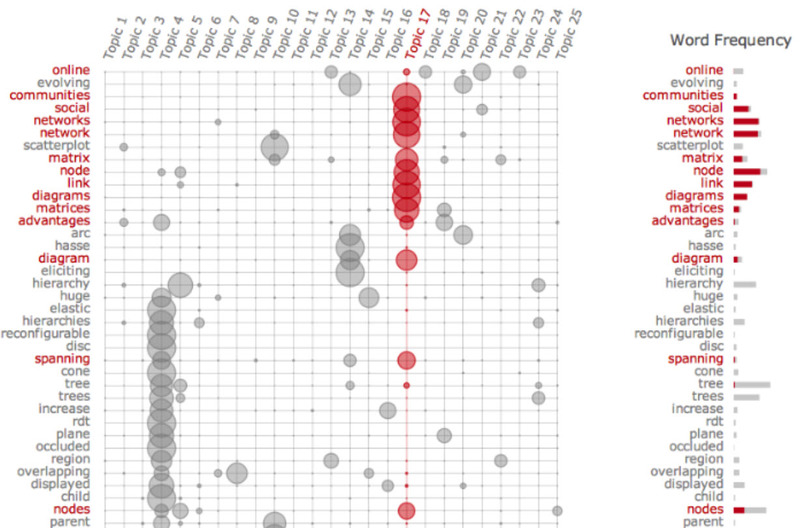 “Exploratory Text Analysis for Large Document Archives.’ Digital Humanities 2014. "Comparative research in thematic space" view (figure on the top right) is designed to allow a researcher to compare the topical compositions of multiple different publications with serial issues (such as newspapers). To do so, it focuses at any one time on a selected set of publications in the corpus (e.g., different newspapers) and a selected set of topics of interest (e.g., topics 9-13 in the figure). Each publication is represented as a worm-like trail composed of colored circles. the position of the circles on the screen (and thus the topography of the worm-like trail for a publication) is determined through a kind of push-pull physics of interaction between the topics being examined. (In detail: "The topics, here represented as squares, exert a 'magnetic' force on each point, pulling each point closer to the topics that are more prominent in that issue. For example, if a given newspaper issue contained words from T9 and T13 in equal measure, with no indication of T10, T11, or T12, then the corresponding circle would be positioned in between the squares representing T9 and T13"). 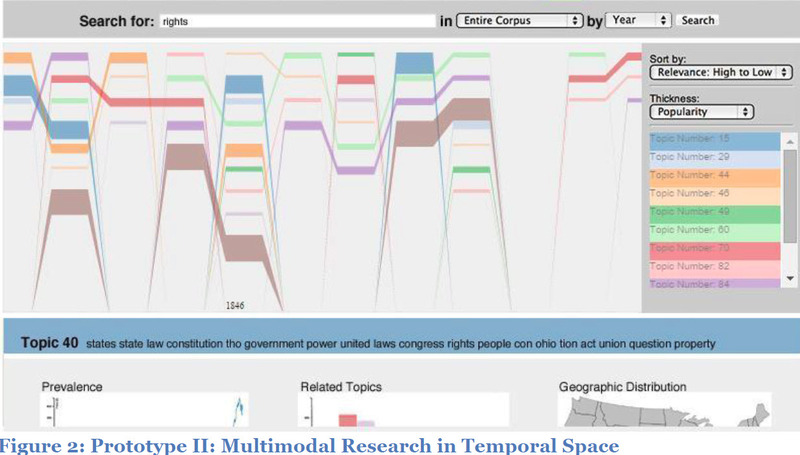 Multimodal research in temporal space view (figure on bottom right) is designed to allow a researcher to compare the trending of topics in time (and is not focused on specific publications). Typing a word into the search bar at the top of the view, brings up a panel list of topics (in the right) ranked by "relevancy" to the search-word ("relevance—the frequency with which the query appears in each topic"). 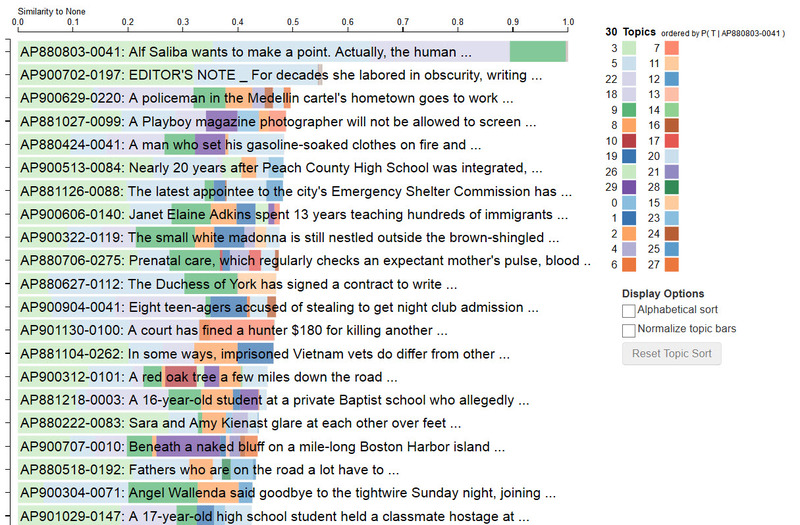 The left panel shows the trends lines of the topics in time, with topics color-coded to match the list of relevant topics. In the trend lines, the thickness of a line indicates the relative weight of a topic at that time in the corpus. Note that "relevance" of a topic to a search-word and weight of the topic in the corpus have no necessary bearing on each other. 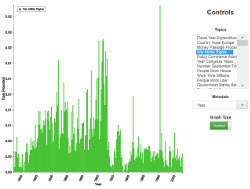 A topic can be highly relevant to a word (if the word is very frequent in the topic), for example, but the topic as a whole, can be less frequent in the corpus. "We also generate the topics before formatting them for visualization. We used MALLET at first, but then had to run a custom topic model since our corpus was so large. Once you have the topics, the format is just a five-column CSV, which you can see here:https://github.com/GeorgiaTechDHLab/TOME/blob/master/a_month_shorter3.csv At the moment, the relevance is hand-calculated for one keyword, since we haven’t built the keyword search function yet, but everything else should be fairly self-explanatory. One of the things I’d like to do soon— (which may be a good option for you) is if you’d like to avoid interacting with MALLET directly, hook our interface into an instance of Bookworm, since one of the things that Bookworm does well is offer an API (of sorts) for extracting all sorts of info from a corpus, including topics. It requires a really huge amount of disk space, since it tokenizes (or otherwise indexes) every single word in the corpus beforehand. But in theory, if you can get everything processed, (and I’ve also had some issues with the initial install, which I haven’t had time to resolve), the actual hooking into whatever interface you develop should be relatively easy." 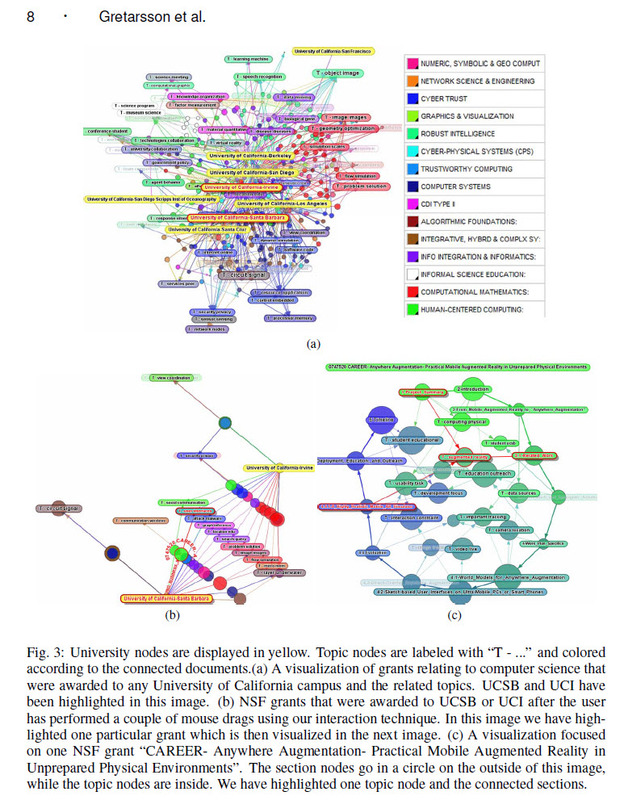 Description: Gardner, Matthew J, et al., "The Topic Browser: An Interactive Tool for Browsing Topic Models"
Topic Browser appears to input data from Mallet. 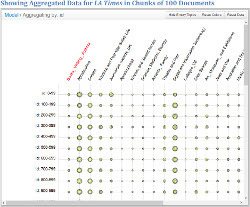 Because the Topic Browser "incorporates three other pieces of information: attributes (metadata) associated with each document, topic metrics, and document metrics," it can use those metrics to rank and filter the topic list in various ways to enhance interpretation -- e.g., by "simple metrics, such as the number of word tokens and types labeled with the topic, to more complicated metrics such as how dispersed the topic is across documents, or how coherent its words are." 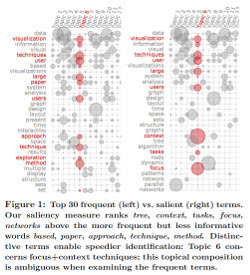 "When browsing through topics, the user can filter the topic list by coherence to eliminate from the view those topics that are mostly meaningless and sorted by document entropy (a measure of the dispersion of the topic across the documents) to find topics that were used widely throughout the corpus." 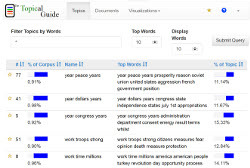 The interface can also show a concordance-like view of topic words in contest, topic word clouds, top 10 documents associated with each topic, top words in a topic, etc. (see the other panels on the top figure to the right). The interface also can plot topics (showing as bars whose length on the Y axis indicates weight) against attributes (metadata) (labeled on the X axis). See for example the bottom figure on the right, which plots the incidence of three different topics (colored blue, green, red) in documents by a number of different politicians (labeled on the X axis). Using date metadata would produce a topic timeline. "The second kind of plot that we include is more useful for analyzing and understanding the behavior of the topic model itself. We allow the user to plot two topic metrics against each other and compute a linear regression. This allows the user to see some interesting properties of the topic metrics, such as the fact that document entropy seems to correlate with the logarithm of the number of tokens in the topic, and that coherence does not seem to correlate with any other topic metric. The user can also find outliers, such as topics with low document entropy but a high token count, that can then be examined in the topic page." Alan: The Topic Browser (whose code site can no longer be found) may have be deprecated in favor of the Topical Guide from the same research unit, the Natural Language Processing Lab of the Brigham Young University Computer Science Department. See below for Topical Guide. 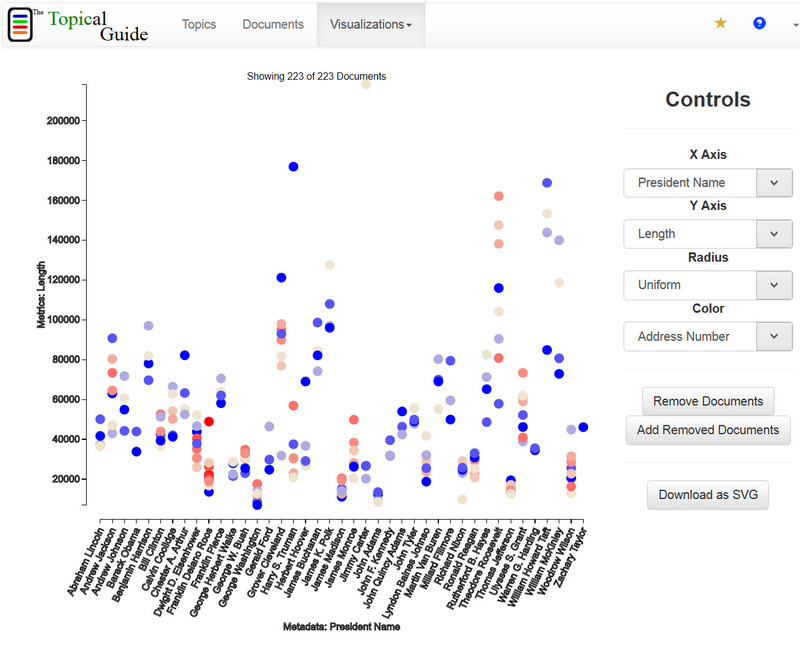 Description: Guide (wiki) | Demo (to run the demo, first select the "State of the Union" addresses corpus, then select the "LDA with 100 topics" analysis, then choose among the "topics", "documents", and "visualizations" views). A start-to-end system that inputs a corpus of plain-text files (with some metadata added at the top of each file in text form) (see their example text files here). 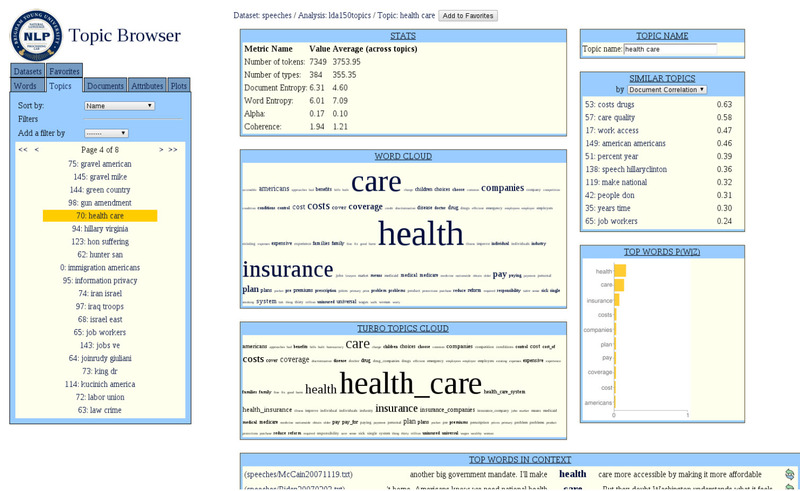 The system then topic models the corpus, opens up a local server, and presents it in a dynamic visualization interface. 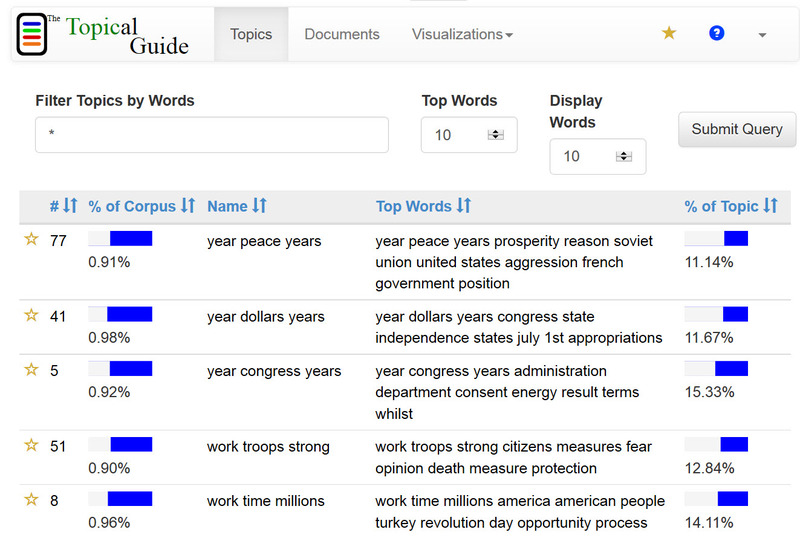 Topic view (1st figure to the right): Shows in column form: topics, topic weights, topic labels, top words in topics (with each column sortable by rank). 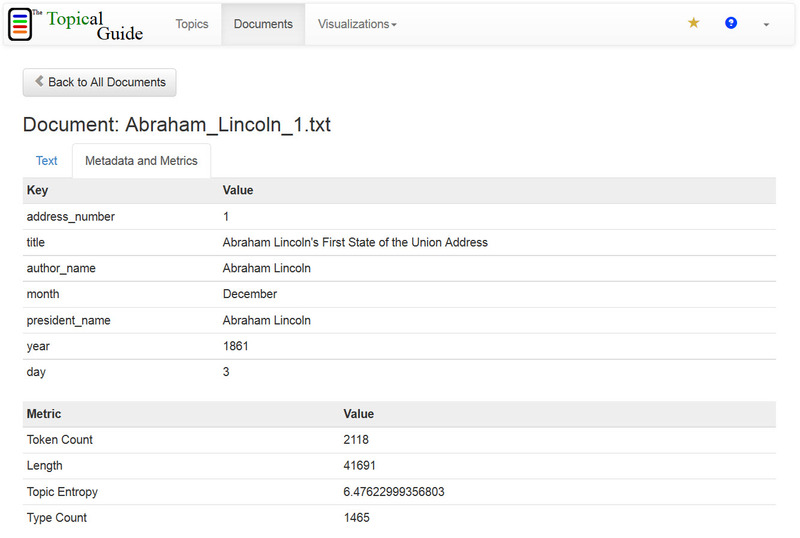 Document view (2nd figure to the right): Shows text of documents (with or without highlighting of topics and topic words); and also shows the metadata concerning each text (including metrics for length, number of tokens, and topic entropy). 2D Plots Visualization view (3rd figure to the right): Plots any two kinds of metadata (e.g., year or author of a document), metrics (e.g., document length, topic entropy), or topic against each other, setting one on the Y axis, the other on the X axis. 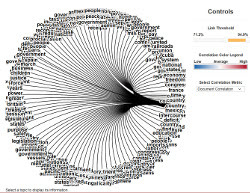 "Chord" Diagram Visualization view (4th figure to the right): arcing chords from one topic positioned on the perimeter of the circle to another topic elsewhere on the circle show correlation (and correlation strength) either by documents (number of docs sharing the topic) or words (number of words the topics share). 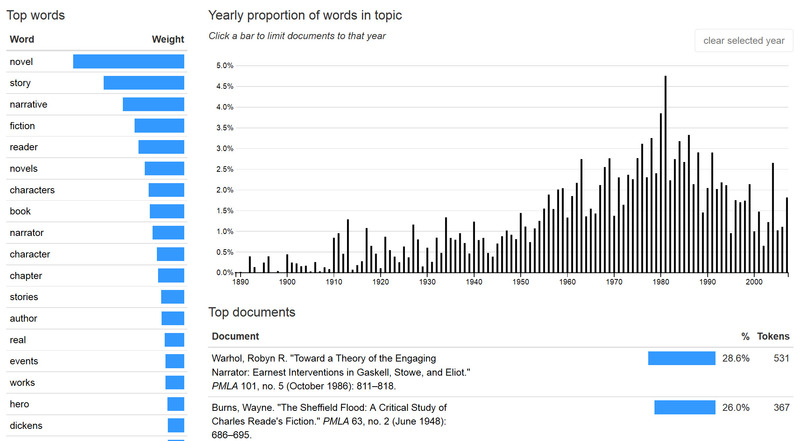 "Topics over time" visualization view (5th figure to the right): Show proportional weight of topics on the Y axis plotted against year on the X axis (or are optionally other available metadata, such as month, author, title of a work, etc.). Alan: to make best use of Topical Guide, we would want to insert some metadata at the top of each of our plain-text document files, which we could do automatically either by scripting information from our scraping spreadsheets, or by re-harvesting the text and other data from our spreadsheets. For example, we could insert at metadata in our files: author, year, month, newspaper title, country, etc. Abstract from the article above: "We present TopicNets, a web-based system for visual and interactive analysis of large sets of documents using statistical topic models. A range of visualization types and control mechanisms to support knowledge discovery are presented. 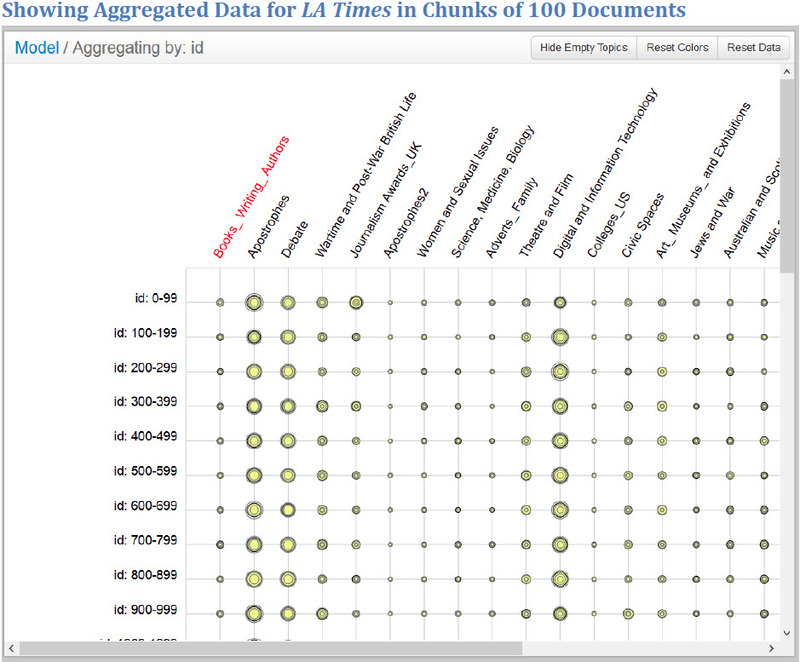 These include corpus and document specific views, iterative topic modeling, search, and visual filtering. 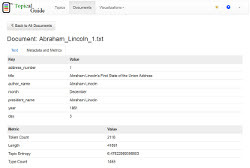 Drill-down functionality is provided to allow analysts to visualize individual document sections and their relations within the global topic space. Analysts can search across a data set through a set of expansion techniques on selected document and topic nodes. 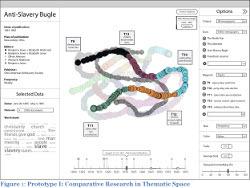 Furthermore, analysts can select relevant subsets of documents and perform real-time topic modeling on these subsets to interactively visualize topics at various levels of granularity, allowing for a better understanding of the documents." TopicNets appears to be a start-to-finish system that does its own topic modeling (or perhaps incorporates Mallet in its processing sequence). Notable interpretive features of interface: A dynamic visualization interface incorporation a re-iterable real-time topic modeling process to allow for adjustment of the model. The main visualization metaphor is a social network graph whose nodes are topics, documents, and/or entities (e.g., individual or corporate authors, institutions, and other entities sourced from metadata or derived in some other way). Edges and proximity represent the relation between those node types--e.g., between documents and topics. "A novel aspect of the layout includes the use of topic similarity to determine node positions, thus creating visual clusters of topically similar documents." Real-time rerunning of topic models: "A key contribution of this work is that TopicNets supports fast, iterative topic modeling which can be ran directly from the interactive visualization in near real time to provide better insight into subsets of interest within the larger corpus." In detail: the topic modeling of very large corpora is done in advance or offline, and then iterative real-time topic modeling can be done on smaller subsets of the data. 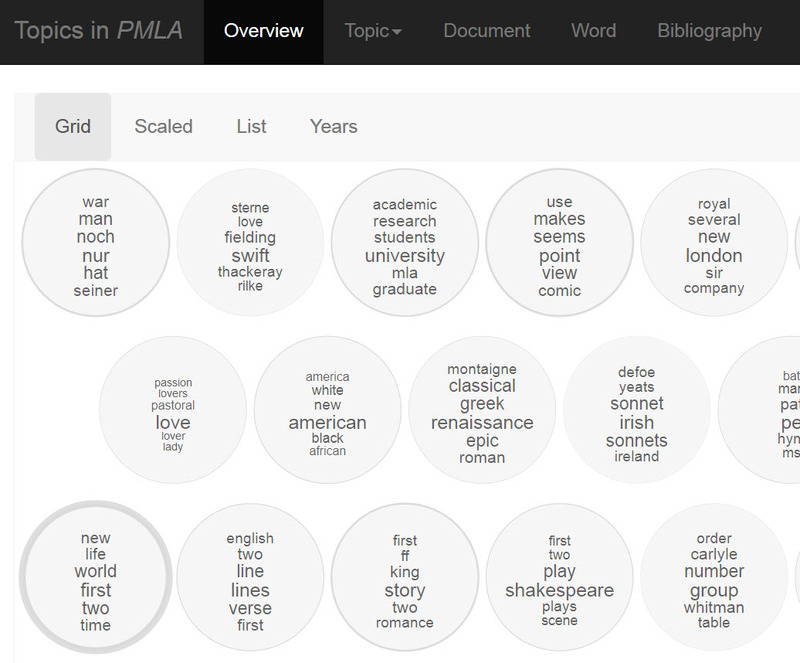 Also, the system can section large documents for topic modeling. Details on demand: "When a user selects a node in the graph all the details of that node can be seen in a panel on the right hand side. If the selected node is a document node, a link to view that document is provided. If the selected node is a topic node, then links to view all the connected documents are provided. Additional options such as select all neighbor nodes and delete node are also provided on this panel." Filterable graphs: "In many cases an analyst is interested in a target subsection of the graph. TopicNets provides multiple methods for filtering the graph in order to get to a visualization of the target information. The user can type in any text and perform a search over the node labels, the top 10 words of all the topics, and/or entire documents. Once the search has completed the user can select a few of the returned nodes from a list, or simply select them all. Once the user has selected a set of nodes of interest he/she can click on a button to visualize only the selected nodes and their immediate neighbors in the graph. Once that button is pressed, all the other nodes are removed from the graph and a new layout is computed. An alternative filtering method we provide is to manually select one or more nodes in the graph and then make the system remove all nodes not in or connected to the selected nodes." Graph manipulation by user: "TopicNets provides a graph interaction mechanism, which allows an analyst to directly manipulate the visualization by clicking on nodes and moving them around the screen. Single or multiple nodes can be selected through search or a ctrl-click and subsequently moved on the screen by click-and-drag mouse movement. Using this technique, analysts can mold the graph to highlight interesting features. For example, selecting all documents by a given author and dragging them to one side will deform most graphs into a tree-like layout in which collaborators with the target author are easily identifiable." 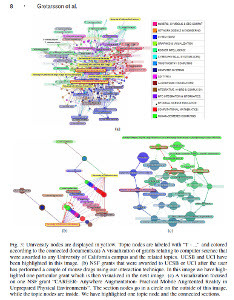 Description: From Jonathan Armoza's Github repository for TWIC: "Data visualization created by Jonathan Armoza that provides hierarchical, top-down and bottom-up views of LDA topic models generated by the popular topic modeler, MALLET. 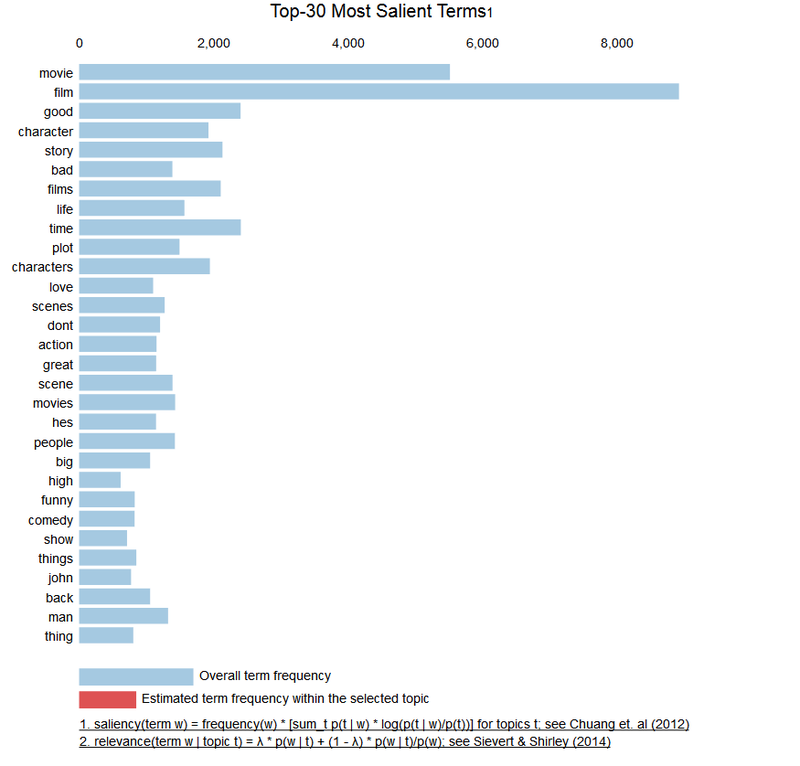 TWiC was born out of the need for digital humanities researchers to understand how the topic word list outputs from topic modelers like MALLET relate to the texts they attempt to model. 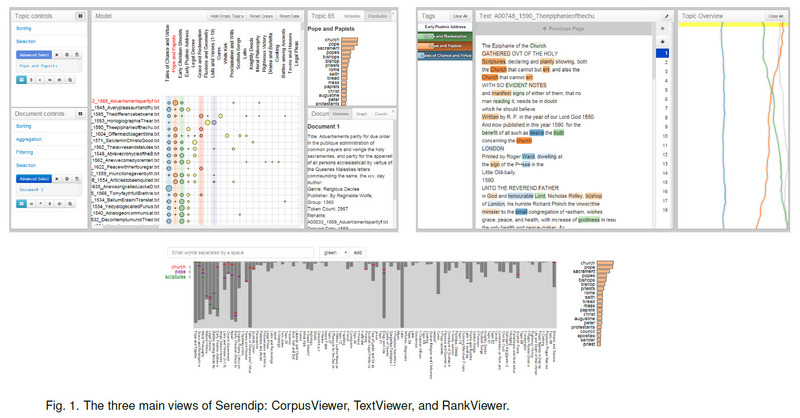 In order to do so, the visualization presents users with multiple, related views that portray how topics are distributed throughout the entire collection of texts being modeled, looking from all the way above - the "big data" view - and diving downward to where topic words are situated in their original contexts in the texts themselves. Each successive view as one browses the visualization, is then considered part of the larger whole of the previous view, or in other words, a subset of texts "underneath" the previous view." 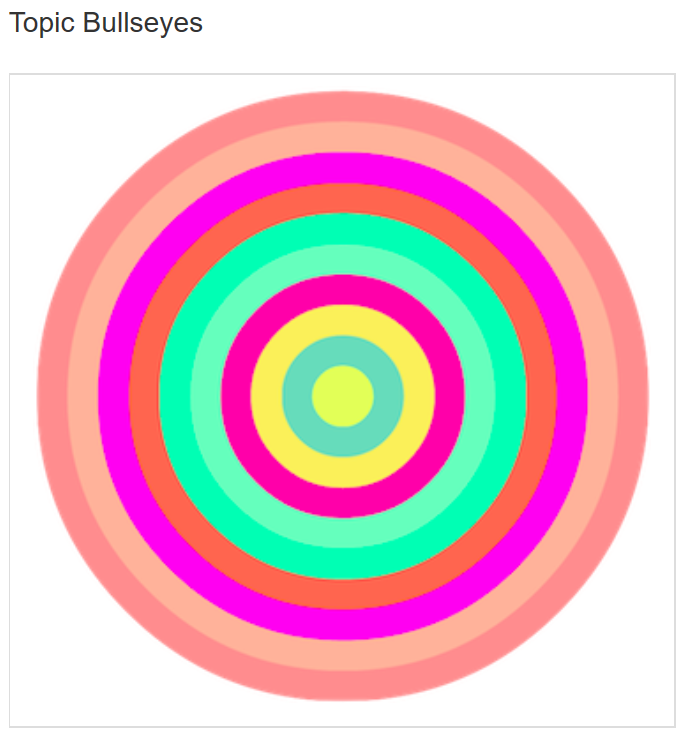 Topic Bullseye: "a bullseye-like abstraction of the top N topics of the texts are being represented. In the image above, this would represent the top 10 topics of a group of texts. Each ring represents a topic and is given a randomly assigned and unique color. Moving inward from the outside of the shape toward the center, more significant topics are represented, until one arrives at the center, or, the top topic." Topic Rectangle: "A shape that utilizes the same paradigm as the topic bullseye, where outer rings (in this case, outer rectangles) represent the top N topics of an individual text. In the image above, this would represent the top 5 topics of one text. At the center of the topic rectangle is a miniature, programmatically-derived (and truncated) view of the text itself and its topic words, each word represented by colored squares among the initial lines of the text. Uncolored words (in a light goldenrod) are words that have been ignored by MALLET." "Graphical Panels" -- "Graphical panels present TWiC's data shapes and their relationships to one another in the model and context of the collection. Informational panels show metadata about those shapes, like the topic word lists themselves and their proportions throughout the various views/levels of the collection. Graphical panels also reveal information about each other too. 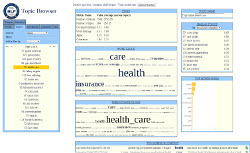 With several on the screen, by mousing over data shapes and double-clicking to open underlying views, the user can not only understand the distribution of topics at a particular viewing height in the collection, but also the relation between the topic distribution as seen in those two or more vantages." 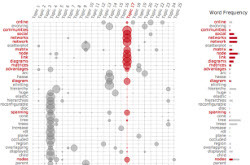 Corpus cluster view -- "Texts clustered by their top topic and seen as topic bullseyes. 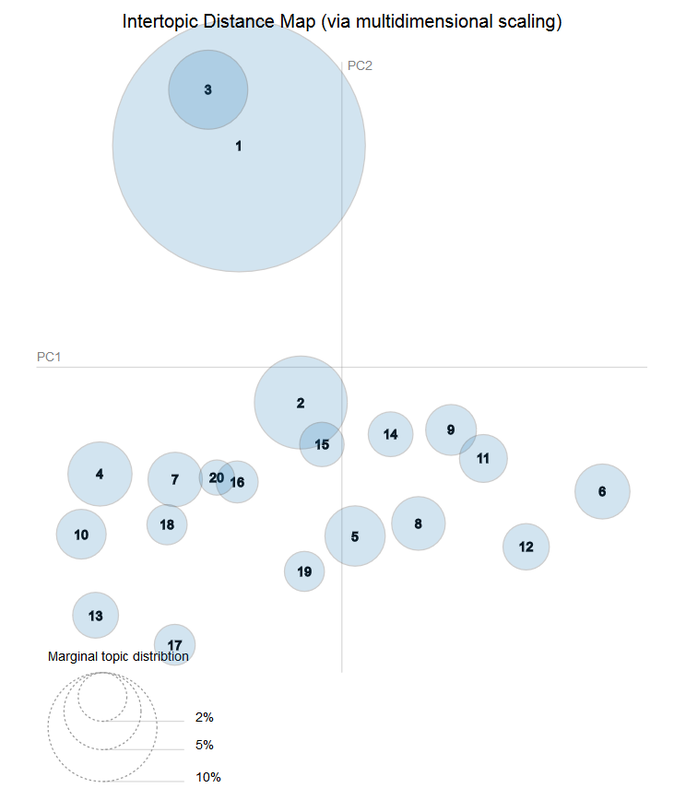 Each bullseye is placed at a distance from the corpus's average topic distribution"
Text cluster view -- "An example of texts/topic rectangles are viewed underneath a corpus cluster's topic bullseye. Each text is set at a distance from the cluster's average topic distribution"
Individual text view -- "A text as selected and viewed from the previous text cluster panel"
Topic Bar -- "Displays and highlights all topic word lists of the model"
Smith, Alison, et al (2014), "Concurrent Visualization of Relationships between Words and Topics in Topic Models"
Veas, Eduardo, and Cecilia di Sciascio (2015), "Interactive Topic Analysis with Visual Analytics and Recommender Systems"
Chang, Jonathan, et al. 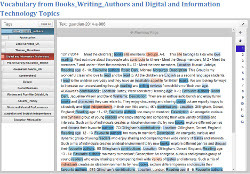 (2009), "Reading Tea Leaves: How Humans Interpret Topic Models"
Option 2: Or upload your HTML document Choose File Indentation level: FORMAT HTML FORMAT HTML IN NEW WINDOW Formatted HTML: The 4Humanities "WhatEvery1Says" project conducted a comparative analysis in 2016 of the following topic modeling systems/interfaces. As a result, it chose to implement Andrew Goldstone's DFR-browser for its own work. Last revised November 26, 2017.